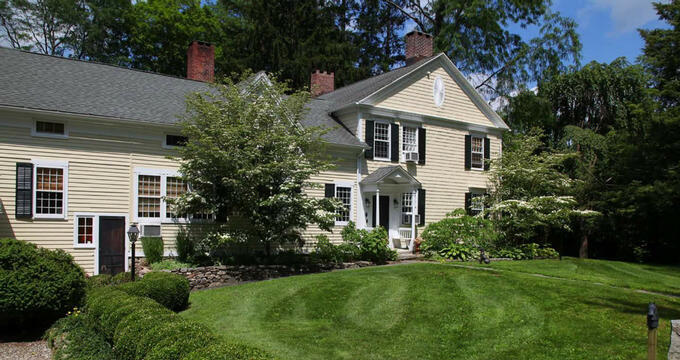 The Inn at Kent Falls began in 1741 as The Flanders Arms, the town center of Kent, Connecticut. Today the historic property has been fully restored as an award-winning bed and breakfast with luxury accommodations on 2.5 acres of lush gardens and flowing waters. No matter the weather, the Inn at Kent Falls provides a romantic setting for a couple’s retreat or mother-daughter weekend, with outdoor pool, spacious private baths, cozy fireplaces and well-dressed queen and king beds. The town of Kent and surrounding communities offer fine dining, antique shopping, wine tasting and seasonal outdoor activities from hiking to skiing. The Inn at Kent Falls features four suites and three rooms, all with private baths, wireless Internet access and TV with DVD player. The Lakes Suite boasts a six-foot clawfoot tub and separate large shower for the ultimate pampering, as well as an elegant four-poster King-sized bed. With main room views overlooking a Weeping Cherry tree, The Falls Suite features a clawfoot soaking tub with a rain shower in the private bath, and adjoining library, and King-sized bed. Constructed in the building’s former attic, The Gables Suite highlights the Inn’s rich history with exposed wooden beams, refinished floors and private stair entrance. The suite also offers a six-foot walk-in shower, sitting area and day bed, queen-sized bed and desk and work area. The farmhouse-style Appalachian Suite is a more private accommodation with sitting room attached to a large main room, antique pine writing desk, iron King-sized bed and plush seating. The twin Willow and Bridge Rooms offer queen-sized beds and large oversized showers, while the larger Meadow Room features large dormer windows, soaking tub and shower and an antique brass bed. The Inn at Kent Falls serves a gourmet breakfast in the dining room daily. For all other meals, guests can explore fine dining options in Kent and nearby communities such as Bantam and Woodbury. In Kent, the Fife ‘N’ Drum Restaurant and Inn offers fine dining in a three-star restaurant for lunch, dinner and Sunday brunch, with evening live piano. Syft Pizza serves wood-fired pies for lunch and dinner in a casual tavern setting, with happy hour specials too. No. 109 Cheese Market offers gourmet cheese, charcuterie and wine products for a delicious snack or unique gift. For a sweet treat, Kent Coffee & Chocolate Company makes hand-dipped chocolates alongside fresh-roasted coffee, as well as specialty chocolates and baked goods. The Inn also recommends Carole Peck’s Good News Cafe in Woodbury, a 200-seat restaurant serving American and global cuisine with a takeout counter, full bar and art gallery with rotating exhibitions. A more casual but highly-rated spot is Wood’s Pit B-B-Q and Mexican Cafe in Bantam. Guests can enjoy the warmer months in Northwest Connecticut lounging by the pool or on the screened-in porch. Two walking paths tour the 2.5-acre property across Cobble Brook, past a waterfall and through the Inn’s lush gardens. In cooler weather, the wood-burning colonial fireplace offers a cozy spot to curl up with a book from the reading room. Kent Falls off of Route 7 is a 200-foot waterfall great for snapping photos from the lookout or picnicking in a meadow at the foot of the falls. Kent also lies in the path of the famous Appalachian Trail, with hiking trails beginning at Bulls Bridge and offering expansive views of the Connecticut countryside. In town, visitors will find an array of antique shops, art galleries, museums and greenhouses to explore. Guests venturing beyond Kent will find pick-your-own produce at Ellsworth Hill Orchard & Berry Farm in Sharon, golf at Bulls Bridge Golf Club in South Kent, and car racing events and lessons at Lime Rock Park in Lime Rock. The Connecticut Wine Trail is a 2-day tour of 14 vineyards in some of the state’s most scenic and historic communities. Along the route lies the White Silo Winery and Farm in Sherman, where blackberries, raspberries, sour cherries and other farm-grown fruit is transformed into specialty dry and semi-sweet wines. Visitors can enjoy a glass at the wine bar or on the terrace with views of gardens, ponds and the surrounding mountains. Family-owned and operated on a centennial farm in Warren, Hopkins Vineyard features a hayloft wine bar overlooking Lake Waramug, plates of cheese and fresh bread and a selection of gifts wine accessories. Lake Waramug itself offers swimming, scuba diving, fishing, canoe and kayak rentals and more, with on-site bathrooms, concessions and camping. Guests can ask Inn staff for recommendations on other nearby seasonal activities such as sleigh rides and carriage rides, whitewater rafting, skiing, snowboarding, horseback riding and more.